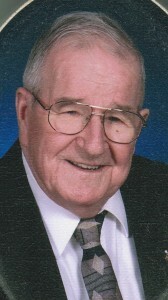 Robert E. Cunningham, 84, of Warren PA died suddenly Monday morning, January 30, 2012 at his residence. He was born December 12, 1927 in Warren to the late George W and Florence M. Severin Cunningham, Sr. A 1946 graduate of Warren High School, Bob was a Warren resident most of his life. He had served in the U.S. Air Force piloting transport aircraft as a Major during the Korean War and was a reserve for the Air Force for 14 ½ years. He earned a Bachelor’s in Mechanical Engineering from the University of Detroit and was an engineer with Dresser Corp. of Bradford and Olean NY for 14 ½ years. Bob had also resided in Corning and Rochester NY. He was a member of St. Joseph R.C. Church, Warren Knights of Columbus, American Legion, Eagles, Moose, Sugar Grove AMVETs, Lakewood Rod and Gun Club. He was a NASCAR enthusiast, collected model cars and supported the Buffalo Bills. He is survived by his wife, Jacquelyn “Jackie” Smith Cunningham, whom he married October 21, 1950 in Warren; 2 sons – Dennis Cunningham and his wife, Gloria of Thomaston, ME, and Brian Cunningham and his wife Joyce of Horsehead, NY; a brother – George W. Cunningham, Jr or Warren; 3 grandchildren; 3 great grandchildren; two step grandchildren; two step great grandchildren; and several nieces and nephews. In addition to his parents, he was preceded in death by one son – Robert Michael Cunningham; one daughter – Colleen Ann Cunningham, who died Friday, January 27, 2012; two grandsons – Brandon and Sean Cunningham; and a sister – Mary Patricia Rimer. I’m so sorry to hear about your husband and your daughter! I remember the times I visited you and Robert at your camp on Rhine Run Rd. and appreciated the stories he shared about working as a mechanical engineer, which I could relate to while working at LIC. My heart goes out to you. I am so sorry to hear about Bob passing away and your daughter as well even though I never met her. I enjoyed working with Bob at Valu Home Center for many years and have nothing but fond memories of him, I’m sure you have many also, and I hope those help you through this trying time. Please feel free to call on me if you need help with anything around the house or if there is anything else I can help with. My home number is 723-8994 and my cell number is 688-0992.